Begin this tour on the Crowsnest Highway #3, at the Alberta and British Columbia border. This less travelled, southern route through the towering Rocky Mountains is a giant gateway to the great outdoors. Explore the Elk Valley's small towns built on more than a century of coal mining: Sparwood, Elkford and the largest and oldest - Fernie. From Calgary, head south on Highway #2A (Macleod Trail) to Highway #22X (21 km / 13 mi). Watch for signs to Spruce Meadows. Take a tour of this local success story, voted #1 horse show jumping facility in the world. Head west on Highway #22X to Highway #22, known as the Cowboy Trail. Highway #22 junction to Turner Valley and Black Diamond is 30 km / 19 mi. Turner Valley is the birthplace of Alberta's oil and gas industry. the site of the 1914 Dingman Discovery Well that began Alberta's first oil boom is now preserved as a National Historic Site. Black Diamond to Nanton is 94 km / 58 mi. Longview offers the Navajo Mug Cafe. Choose from 21 homemade pies. Thirteen kilometres (8 mi) farther south on Highway #22 is Bar U Ranch National Historic Site, a living tribute to the ranching industry in Alberta. Continue past Chain Lakes where you leave the Cowboy Trail to head east on Highway #533 to Nanton. Stroll the historic main street of Nanton with antique and specialty shops. Nanton to Cardston is 142 km / 88 mi. Highway #785 will take you to Head-Smashed-In-Buffalo Jump. This UNESCO World Heritage Site is one of the oldest, largest and best preserved buffalo jumps in North America. Visit Fort Museum of the Northwest Mounted Police in Fort MacLeod. Cardston boasts North America's largest collection of horse drawn transportation at the Remington Carriage Museum. Cardston to Waterton Lakes is 50 km / 31 mi via Highway #5. Take time to tour Waterton Lakes National Park. The smallest of the Canadian Rocky Mountain National Park is described as the Jewel in the Crown of the Continent. Home to plants and wildlife unique in Western Canada, it is a paradise for nature lovers and outdoor enthusiasts. Attractions include the Waterton Shoreline Cruise, Red Rock Canyon and Cameron Lake hiking trail. Highway #6 and #3 lead back to the BC / Alberta border (113 km / 70 mi). There are several small former coal mining communities with a fascinating history to explore along this route. At Pincher Creek is the Kootenai Brown Pioneer Village, a turn-of-the-century 19th century historic village. Frank Slide Interpretive Centre explains how coal mining caused the Turtle Mountain landslide that buried the town of Frank. After driving past Coleman, you leave Alberta, cross the Continental Divide and enter the province of British Columbia. Sparwood is the gateway town to the region. The Terex Titan, the world's largest tandem axle dump truck, stands silently at the town's entrance - a monument to Sparwood's major industry. Just beyond this community is a treasure trove of adventure. Sparwood to Elkford is 35 km / 22 mi north on Highway #43. Elkford is 'Wild at Heart' and the most remote town in the region. It is the gateway to two majestic wilderness provincial parks: Elk Lakes and Height of the Rockies. The area is a popular destination for a range of outdoor recreation including ATV touring, hiking and mountain biking. Sparwood to Fernie is 29 km / 18 mi south on Highway #3. Fernie boasts small town charm and big mountain adventure. The brick and stone facades of the historic downtown are nestled below the jagged peaks of the Lizard Range. Fernie offers a huge network network of mountain biking and hiking trails, a bike park, a zip line, fishing, whitewater rafting and more. Fernie to Elko is 32 km / 20 mi south on Highway #3. You'll follow the pristine Elk river that is famous for fly-fishing and other water-sports. The views and wildlife are just as rewarding. Elko to Fort Steele Heritage Town is 63 km / 39 mi north on Hwy #3/93. Take a side trip to Kikomun Creek Provincial Park and Lake Koocanusa for sandy beaches, camping and Kokanee salmon fishing. At Wardner, watch for signs to the Kootenay Trout Hatchery that offers an interpretive area with aquaria, educational displays and fishing pond. Fort Steele Heritage Town has been a family favourite for decades. Leap back to the 1890s and experience this restored pioneer boomtown. Attractions include street drama, Wild Horse Theatre, steam train and horse drawn wagon rides, International Hotel Restaurant and gold panning. Fort Steele to Wasa Lake Provincial Park is 25 km / 15 mi. Wasa Park is a family destination with camping, sandy beach, and a biking and walking trail that circles the lake. Travel north on Highway #93/95 to Invermere (90 km / 56 mi). Attractions at Canal Flats include the Tilley Memorial Park with a beautiful beach and picnic tables as well as The Source of the Columbia Trail that winds 1.5 kms through the wetlands. A number of back-country and resort setting hot springs are located along this route. Check the Hot Springs Itinerary for details. Invermere is a small, friendly town situated on Lake Windermere, one of the warmest lakes in the region. Spend the day at the beach, but be sure to explore the impressive shops, galleries and restaurants downtown. Panorama Mountain Resort, 18 km / 11 mi west of Invermere is all about play - water-park with water-slide and hot pools, adventure camps, bike park, rafting, ATVing, restaurants, shops and championship and mini golf. Invermere to Radium Hot Springs, gateway to Kootenay National Park, is 13 km (8 mi) farther north on Highway #93/95. 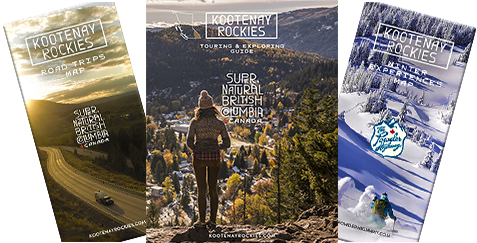 Travel through spectacular Kootenay National Park, (104 km / 65 mi) north on Highway #93 - check out the Golden Triangle Driving Route for details on park attractions. Once through the park, connect with Trans Canada Highway #1 and head east through Banff, the longest established national park in Canada. Banff to Calgary on Highway #1 is 136 km / 85 mi. En route is the picturesque mountain town of Canmore. Fernie's Aerial Playground and Zipline Attraction. Radium Hot Springs' resident Rocky Mountain Bighorn Sheep. Kootenay National Park offers guided interpretive hikes. Listen: Fernie's Legend of 1887. Listen: Facts about Bighorn Sheep.